WASHINGTON— A new analysis by the Center for Biological Diversity Action Fund shows that not a single state has laws in place that are as protective for imperiled wildlife and plants as the federal Endangered Species Act. The vast majority of states also do not allocate sufficient funding to ensure the recovery of imperiled species within their boundaries, the nationwide report found. Republicans who oppose the Endangered Species Act have long advocated for states to take over management of endangered species. In 2018 Sen. John Barrasso (R-Wyo.) introduced legislation with that intent even though Wyoming doesn’t even have a law to protect endangered species. Today’s report, Unready and Ill-Equipped, analyzed the likely fate of endangered species if this type of legislation were enacted into law. The report reviewed every state’s legal and regulatory authority to protect imperiled species, as well as funding and resources provided for their wildlife-conservation programs. 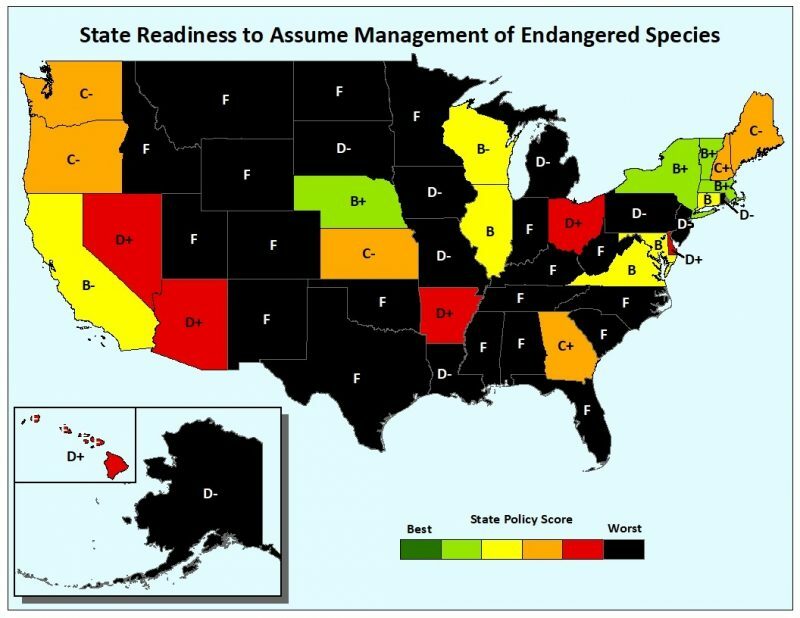 Thirty-four states received an overall grade of a D or F, including Wyoming, Utah, Alaska, Montana and Idaho, the states that have most aggressively sought to weaken the Endangered Species Act. The report assessed each state’s laws on key criteria that have made the federal Endangered Species Act so successful, including (1) science-based listing and protection of critical habitat; (2) requiring state agencies to minimize harm to species through a consultation process; and (3) strong enforcement provisions. Only five states protect habitat for threatened and endangered species to a similar degree to the Endangered Species Act. Only seven states require that state agencies consult in advance with the state wildlife agencies to ensure that state activities do not harm threatened and endangered species. Twenty-nine states do not have the authority to protect the full spectrum of plants and animals covered by the Act. One of the most common lines of attack on the Endangered Species Act in recent years has been to propose legislation that would turn management of the Act over to the states. Members of the Republican-only “Western Caucus” and members of the Western Governors’ Association have repeatedly demanded increased state authority over imperiled animals and plants. The Center for Biological Diversity Action Fund is a national nonprofit organization that advocates for legislation and legislators that will advance a progressive environmental agenda. The Center Action Fund is the 501(c)(4) affiliate of the Center for Biological Diversity, but these organizations’ names are not interchangeable.